If you look closely at this tombstone you will notice that a barber pole is carved into it. Jacob Duff was one of Chatt’s barbers in 1930s and 40s. This information was in his obituary, which Dorothy Jean (Leininger) Hellwarth had cut out of a newspaper years ago. It was among her clippings and photos that I scanned last spring. Funeral services for the late Jacob W. Duff, 66, of Chattanooga, who died at the Adams County Memorial Hospital, Decatur, will be held Tuesday afternoon at 2 o’clock. The rites will be conducted at the Chattanooga Methodist Church, with the Rev. J. True Yocum in charge. Burial will be made in Kessler Cemetery. He had been a resident of Chattanooga for the past 14 years and was a barber. He was a member of the Masonic Lodge. He was born in Jay County, Indiana, February 13, 1882, the son of the late Mr. and Mrs. James Duff. He was united in marriage with Rosa Buckley May 15, 1907 and she survives together with their children, namely, Mrs. Evelyn Carter of Ft. Wayne, James G. and Robert W. Duff of Ft Wayne, Howell Duff of Decatur, Gene Duff of Willshire and Paul Duff at home. One son is deceased. His five brothers are Oiley and Earl Duff of Florida; Finley and Ross Duff of Buckley, Michigan; and Ray Duff of Geneva. Two sisters are deceased. There are 15 grandchildren and one great grandchild left to mourn. Mr. Duff had been in failing health for the past five years and his condition was serious since January. He died Saturday afternoon from Angina Pectoris. Rosa’s name was recorded as Buckey in their marriage record and in the 1900 census, but as Buckley in Jacob’s obituary. Unidentified newspaper clipping from Dorothy Jean (Leininger) Hellwarth, dated 27 March 1948. 1900 U.S. Census, Jefferson, Adams County, Indiana, ED 4, p. 12A, dwelling 215, family 215, line 35, James M. Duff; digital image by subscription, Ancestry.com (http://www.ancestry.com : accessed 20 Oct 2013); from FHL microfilm 1240357, from NARA microfilm T623, roll 357. “Indiana, Marriages, 1811-1959,” index and images, FamilySearch (https://familysearch.org/pal:/MM9.1.1/XXJX-K4H : accessed 20 Oct 2013), Jacob W. Duff and Rosa Dell Buckey, 1907, from Vol 1, 1905-1911, p. 216. “Indiana, Marriages, 1811-1959,” index and images, FamilySearch (https://familysearch.org/pal:/MM9.1.1/XXV3-YQG : accessed 20 Oct 2013), Jacob M Duff and Rosa Buckey, 1917, from Vol 1894-1914, p. 203. 1910 U.S. Census, Montgomery County, Ohio, Ward 4 Dayton, ED 65, p. 4B, house 1208, line 72, Jacob W. Duff; digital image by subscription, Ancestry.com (http://www.ancestry.com : accessed 20 Oct 2013); from FHL microfilm 1375229, from National Archives microfilm T624, roll 1216. 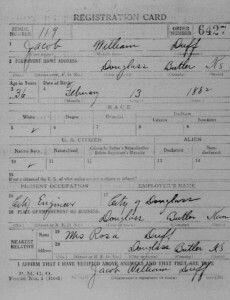 “World War I Draft Registration Cards, 1917-1918,” digital images, FamilySearch (https://familysearch.org/pal:/MM9.1.1/K66H-94K : accessed 20 Oct 2013), Jacob William Duff, serial no. 119, order no. 6427, 12 September 1918, Douglass, Butler County, Kansas; from FHL microfilm 1643425, from NARA microfilm publication M1509. 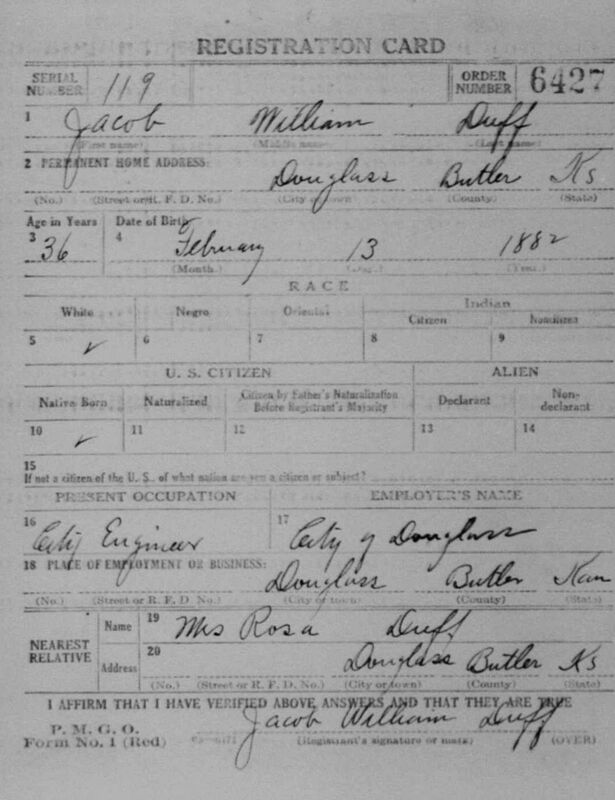 1920 U.S. Census, Douglass, Butler County, Kansas, ED 12, p. 6B, dwelling 160, line 86, Jacob Duff; digital image by subscription, Ancestry.com (www.ancestry.com : accessed 20 Oct 2013); from NARA microfilm T625, roll 523. 1930 U.S. Census, Jefferson Township, Adams County, Indiana, ED 4, p.3A, dwelling 48, family 48, Jacob W. Duff; digital image by subscription, Ancestry.com (www.ancestry.com : accessed 20 Oct 2013); from FHL microfilm 2340309, from NARA microfilm T626, roll 574. 1940 U.S. Census, Chattanooga, Liberty Township, Mercer County, Ohio, ED 54-22, family 291, line 72, sheet 14B, Jacob W. Duff; digital image by subscription, Ancestry.com (www.ancestry.com : accessed 20 Oct 2013); NARA digital publication of T627, roll 3114. “United States World War II Draft Registration Cards, 1942,” index and images, FamilySearch (https://familysearch.org/pal:MM9,1,1/X5CH-4WL : accessed 20 Oct 2013), Jacob William Duff, Serial no. 65, 1942, Mercer County, Ohio. A barber in Chatt! That seems almost incomprehensible to me. Guess I simply do not ever recall seeing a barber in Chatt, so it does not fit some how. Now I remember Willshire having at least 2 barbers at one time. Certainly Rockford must have had several, though I personally only remember the beauty salon to which my mother occasionally went. Seems there was also a beauty salon in one of the homes near the school in Willshire, very near, if not in the Avery home. Is there a single barber in any of the three villages today (Chatt, Willshire or Rockford)? I think not, not for many years. Why would there have been several barbers there in years when most people cut their own hair and few got it cut more than a few times a year, and now when nearly every man frequently gets a barber cut, they are all gone. Is it that easy to drive the extra 20 miles? They survived on 50 cents or one dollar per cut where now it runs closer to 20 bucks. Small town living can not sustain a barber? Must be more to the story. Yes, Chatt had several barbers over a period of time. Howard Caffee and Carl Schroeder come to mind, so I have heard. And Chatt had a barber shop that now sits in a woods. You should revisit my Chatt Barber post. Edna Avery was the beautician in Willshire. My mom always went there to get her hair done. I’m not sure if there is a barber in Willshire now. I believe Gary Brehm was a barber in Willshire at one time but he may be in Rockford now. Not sure. 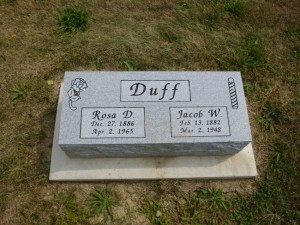 Jake and Rosie Duff were relative of mine through my grandmother Kathryn Black. Grandma often told how Buckeys changed their names to Buckleys. My grandma kept house for Jake and Rosie as a hired girl when she was young. They were cousins through her mother. I have several depression dishes that were from grandma and she received while working for Duffs as gifts. Well that is sure interesting! What a small world. You have mentioned Chatt connections before. And that explains the Buckey/Buckley name difference. Thanks for the information Brian! Just found this and I’m just thrilled. 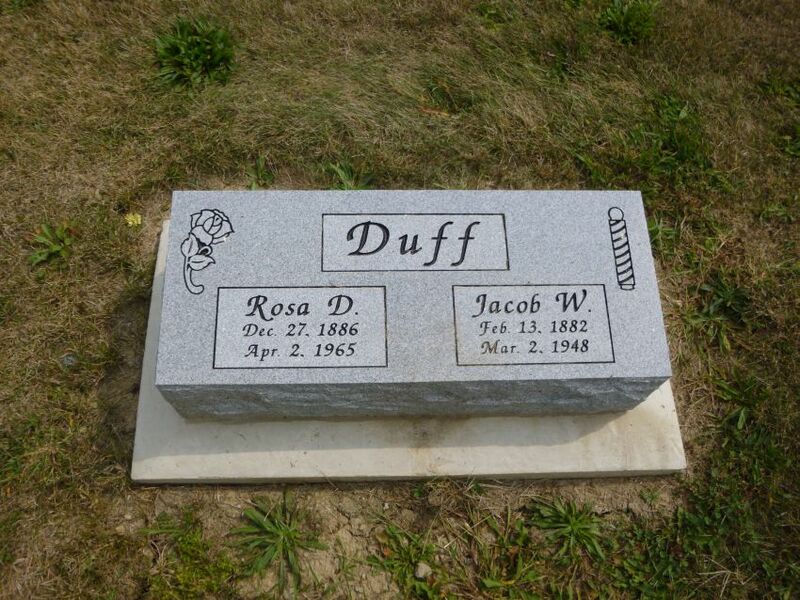 Jake and Rosa Duff are my grandparents, my father is Paul, who sadly passed away in 2005. Thank you for your research. My grandfather died long before I was born and Grandma Rosa died when I was 9 years old. I only have a couple of memories of her as she was blind and I’ll for most of my remembrance of her. Thank you for giving me a picture of them. So glad you found the information interesting. Thanks for reading! I just found this information and was thrilled! My father was Howell Duff, son of Jacob and Rosa and like Uncle Paul’s daughter wrote, I remember Gramma Duff at Mrs. Heiman’s home with another blind lady, Emma. My gramma Rosa crocheted even while blind, and I still have a little beanie she made for me!! What nice memories! Amazing that she could crochet even though she was blind and that you have the beanie she made. Glad you enjoyed the information and thanks for writing!